From 4 to 10 March 2017 a solo exhibition of the artist Alexandra OTIEVA will be held in AIAPUNESCO Monaco at 10 Quai Antoine 1-er, Monaco, ground floor. The exhibition will be open from 14.00 to 18.00. Free admission. Why is this exposition worth visiting? 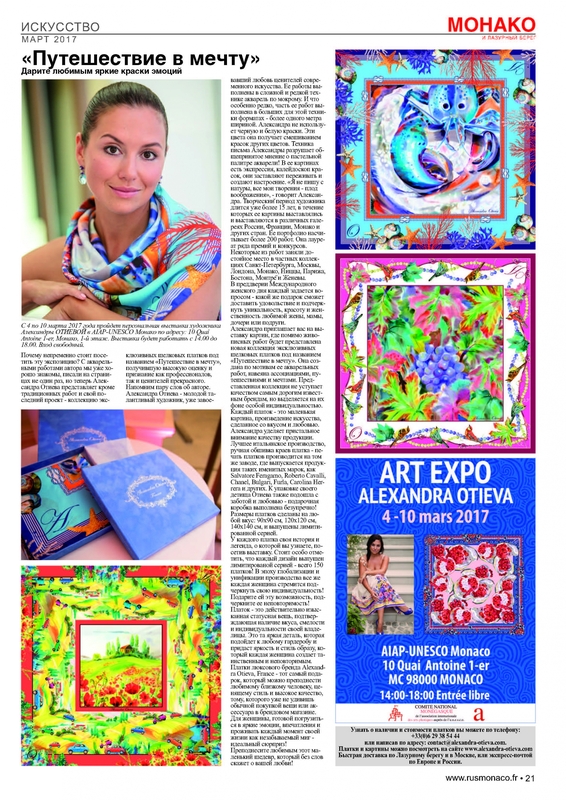 We are already well acquainted with the watercolour works of the author, we wrote about them more than once, but now Alexandra Otieva presents her latest project besides a traditional one – a collection of exclusive silk scarves called "Journey to a dream", which was highly appreciated and recognized by both professionals, and connoisseurs of beauty. Let us recall a couple of words about the author. Alexandra Otieva is a young talented artist who has already gained the love of connoisseurs of contemporary art. Her works are done in a complex and rare watercolour technique – on a wet sheet. And – that is especially rare thing for this technique – part of her works is done in large formats – more than one meter in width. Alexandra does not use black and white colours. These colours she gets by mixing other colours. Alexandra's painting technique destroys the generally accepted opinion about the pastel palette of watercolours! In her paintings, there is an expression, a kaleidoscope of colours, they make you feel sympathetic and create a mood. "I do not write from nature, all my creations are a figment of imagination," Alexandra says. The creative period of the artist lasts for more than 15 years, during which her paintings were exhibited and are still exhibited in various galleries of Russia, France, Monaco and other countries. Her portfolio includes more than 200 works. She is a laureate of a number of awards and competitions. Some of the works take a rightful place in private collections of St. Petersburg, Moscow, London, Monaco, Nice, Paris, Boston, Montreux and Geneva. On the eve of the International Women's Day, everyone asks themselves what gift can satisfy and emphasize the uniqueness, beauty and femininity of a beloved wife, mother, daughter or girlfriend. 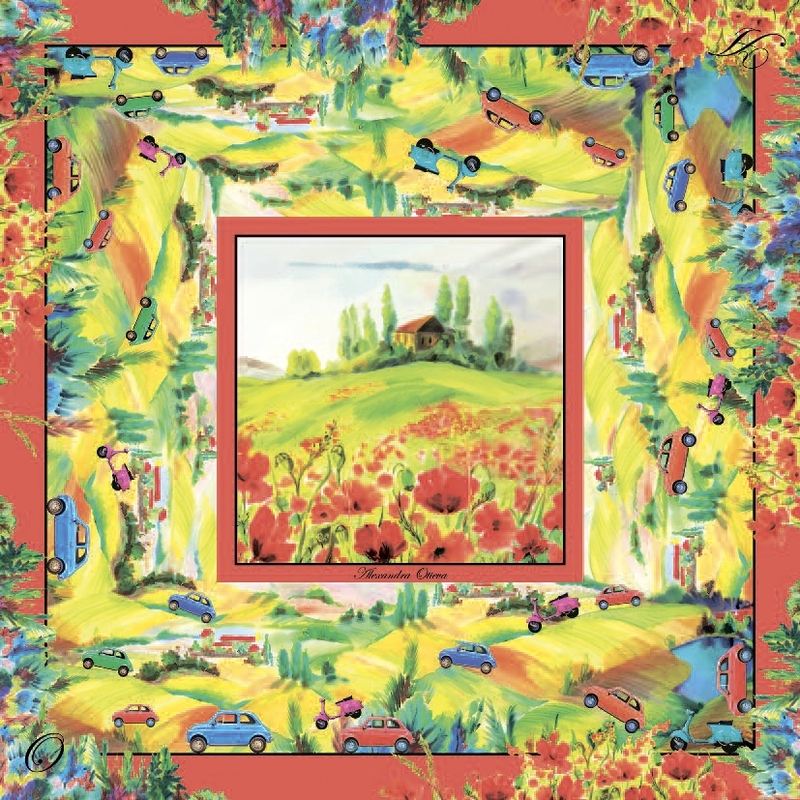 Alexandra invites you to an exhibition of paintings, where, in addition to paintings, a new collection of exclusive silk scarves called "Journey to a dream" will be presented. It is created on the basis of her watercolour works, inspired by associations, travels and dreams. The quality of the presented collection is not inferior to the quality of the most expensive well-known brands, but stands out against their background due to its individuality. Each scarf is a small picture, a work of art made with taste and love. Alexandra pays close attention to the quality of products. The best Italian production, manual overseaming of scarves, printing on scarves is made at the same plant where the products of such famous brands as Salvatore Feragamo, Roberto Cavalli, Chanel, Bulgari, Furla, Carolina Herrera and others are produced. Otieva also expresses love and care in packing of her brainchild – the gift box is perfect! The sizes of the scarves will suit every taste: 90x90 cm, 120x120 cm, 140x140 cm, and are of a limited edition. Each scarf has its own story and legend, which you will learn while visiting the exhibition. 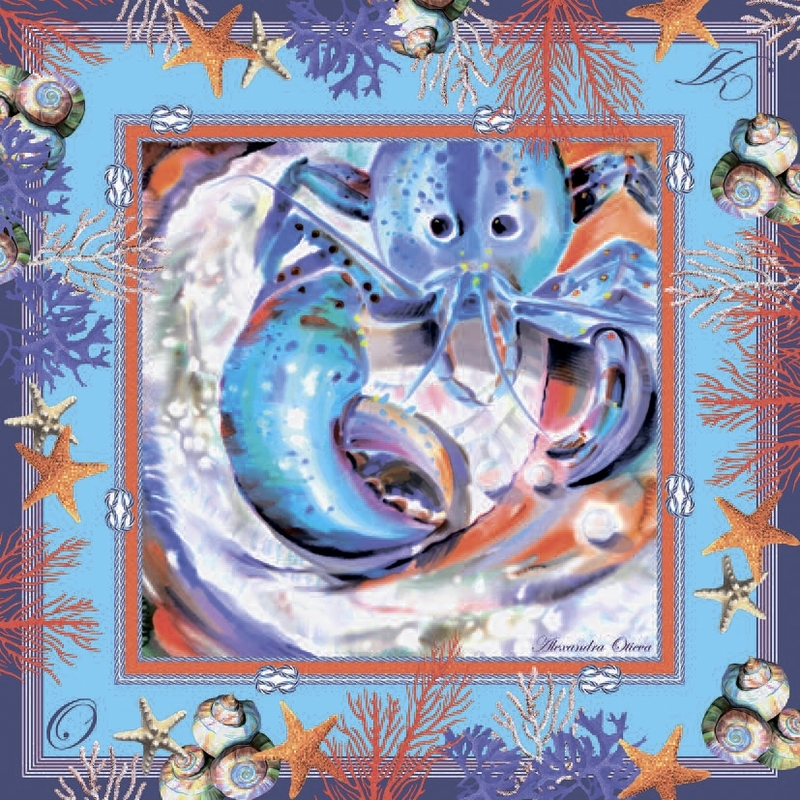 It is worth mentioning that each design is released in a limited edition – only 150 scarves each! In the era of globalization and the unification of production, every woman seeks to emphasize her individuality! Give her this opportunity, emphasize her uniqueness! A scarf is really an exquisite status item, which confirms the taste, daring and personality of its owner. This is a bright detail that will suit any outfit and will give brightness and style to the image that is created mysterious and unique by each woman. 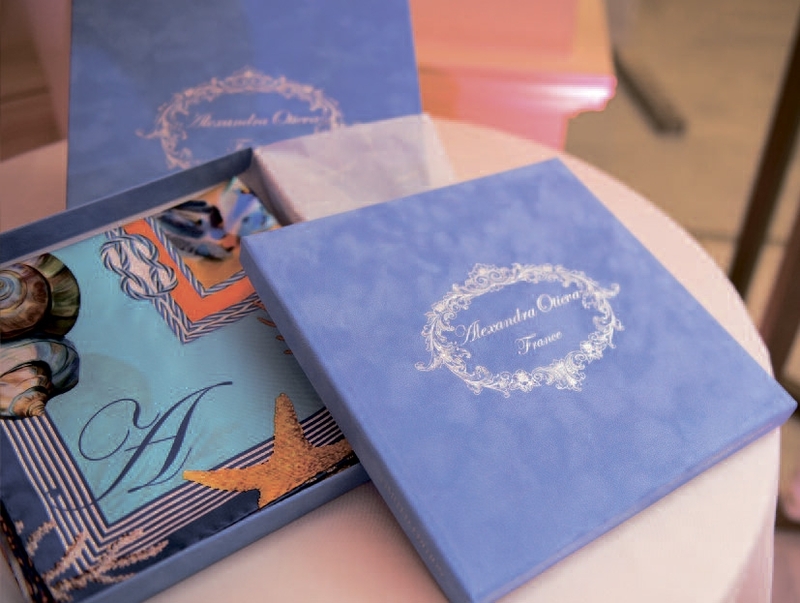 Scarves of the luxury brand Alexandra Otieva, France – the very gift that you can present to your beloved one who values ​​style and high quality, to someone who is no longer surprised by the usual purchase of a clothes or accessory in a brand store. It is for a woman ready to immerse herself in bright emotions, impressions and live every moment of her life as an unforgettable one -an ideal surprise! Present this favourite little masterpiece to your beloved, and it will tell about your love without any words!